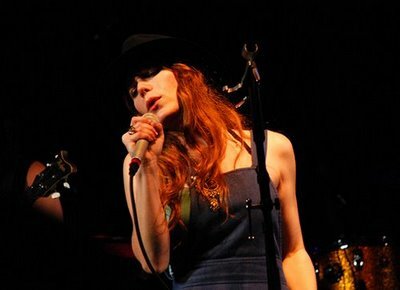 Fresh off Rilo Kiley's Under the Blacklight tour, the band's founder and co-lead singer Jenny Lewis will release Acid Tongue on Sept. 23. This comes two years after her internationally-acclaimed solo debut, Rabbit Fur Coat. Although Acid Tongue is Lewis' first major label effort as a solo artist, no expensive, fancy recording tools were used. The result is a beautifully haunting collection of 11 all-analog tracks that aren't as retro as its recording method suggests, but don't quite belong in this decade either. Lewis is sans Watson Twins this time around, but she keeps up the tradition of all-star collaborators on Acid Tongue, including Johnathan Rice, Rilo Kiley drummer Jason Boesel, Farmer Dave Scher, M. Ward and Chris Robinson of The Black Crowes. Elvis Costello joins Lewis for a duet on "Carpetbaggers" and Zooey Deschanel and Vanessa Corbala provide backing vocals.